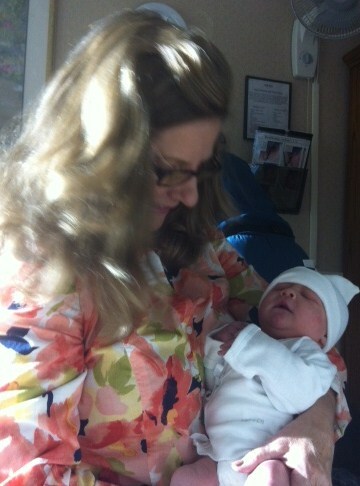 My New Grandson, Henry William Benson! Hello Dear Readers! Well as you can see there’s been some excitement around here. My new little grandson Henry William began his new life out in the real world on Saturday night after a long, leisurely road trip through BC (Birth Canal). On his way through BC, Henry chose to dilly dally, making frequent stops along the way for snacks and pictures, then taking a nap or two — completely oblivious to the fact that there was a room of people anxiously awaiting his arrival. Finally at long last, somebody just went and got the scissors and showed Henry the ol’ Cesarean Shortcut. My daughter, Jackie, was a trooper through the entire 23 hours of back labor, front labor and sideways labor. But not to worry. She had a mid-wife who was there to help her! The mid-wife, whose name was . . . well, let’s just call her . . . oh I don’t know . . . I’m just picking a name at random here — let’s just call her Salisbury Steak. Salisbury Steak, just for the record, Dear Readers, was about 40 years old and in those 40 years, had somehow managed to learn every bit of information a person could possibly learn with the possible exception of Albert Einstein and even he didn’t know as much about birthin’ babies as Salisbury Steak! To prove my point, here’s a conversation Salisbury Steak and I had after Jackie had been in labor for 22 hours and her blood pressure had dropped to 60 over 30. Me: This isn’t going well, I’m concerned. Salisbury Steak: Oh, is that your medical opinion? Me: She’s dizzy and her blood pressure is extremely low, and she’s been in labor for 22 hours she’s been pushing for almost 3 hours and the baby isn’t any farther down than he was three hours ago! Salisbury Steak: First of all, 60 over 30 is not low! She just needs to drink some apple juice, besides the baby is moving down now. Me: But isn’t this his foot way up here? Salisbury Steak: What? No. Let me feel it. No, that’s just a fibroid tumor! Me: But she shouldn’t be drinking apple juice! At this point, she shouldn’t be drinking anything! Me: I’m concerned, we need to do something! Salisbury Steak: Oh really? 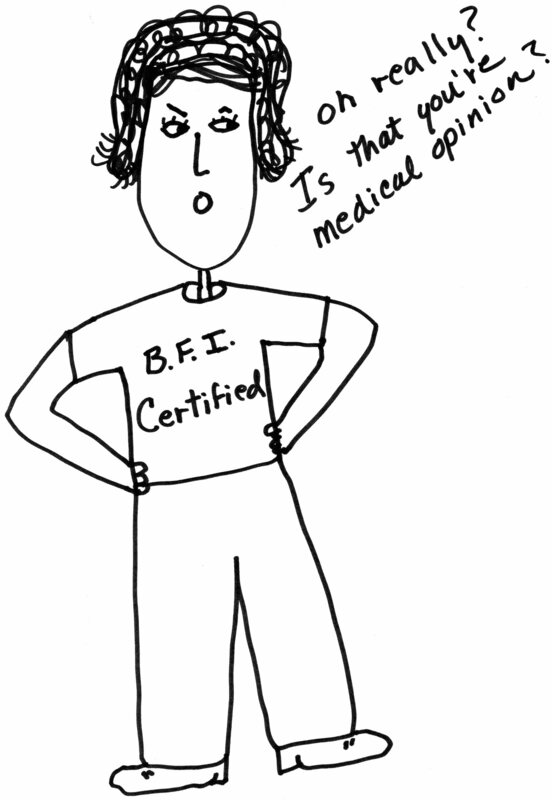 Is that you’re medical opinion? Do you see how well Salisbury Steak handled the situation? Her assessment that Jackie’s blood pressure of 60/30 was simply a result of Jackie’s mother being overly concerned and micro-managing Salisbury Steak’s sweet mid-wifing skills — was nothing short of brilliance. And furthermore, it was becoming quite obvious that I was making Salisbury Steak’s mid-wifing experience a bummer and that I needed to please shut up! Anyway, by the grace of God, our sweet little Henry finally made his debut into this world thanks to the doctor who performed the cesarean section –and both mother and baby are safe and sound! Before Salisbury Steak left she gave me a great big hug and said good-bye. And I, too, bid farewell to Salisbury Steak. A mother’s intuition should never be ignored! It sounds like Salisbury Steak (S.S.) didn’t want to say she was wrong and hand Jackie off to a doctor when she really needed it. Clearly S.S. missed the common sense training of her midwifery. On top of Jackie already having low blood pressure and a propensity to faint, it’s like S.S. didn’t know her patient AT ALL. I’m glad you were there to at least voice your concerns and see Jackie (and Tyler) through it! Really, this is just the tip of the ice burg of all the stuff she did that was downright dangerous. She actually left the room when Jackie’s blood pressure got that low and I had to go find her! She was careless and callous. (Not to mention rude and disrespectful.) It’s just a matter of time before she makes a serious error that will cost someone their life. It was a horrendous situation. Just horrendous. That is absolutely awful. Not acknowledging Jackie’s heart-rate is egregious behavior for a “medical professional.” That is on top of whatever else she did during the delivery. She put her patient and baby at serious health and safety risk, and at the very least she took away any sort of decent birthing experience Jackie could’ve have, instead forcing her to struggle and suffer unnecessarily. I hope the doctor’s office where she works is made aware of her mishandling of Jackie’s labor and delivery. As you said, with that sort of behavior, it’s a matter of time before an even more serious consequence occurs. You are absolutely right, Erin. I don’t know what kind of training this midwife had but I do know that the RN who was infinitely more caring, concerned, and professional had to defer to this bimbo. It was just bizarre. The RN did a stellar job. She was watching the monitor and noticed that when the baby was “declining” (which happened several times, which the midwife didn’t even notice!) and suggested they move Jackie into a different position — while the Midwife sat there on the end of the bed somewhat distracted and totally unconcerned about the difficulty Jackie was having. She acted like Jackie was being kind of a baby! Which she wasn’t!! She also hooked Jackie up to Pitocin to help Jackie along, which made things even worse. Then when she FINALLY decided on a C-section, she FORGOT to unhook the Pitocin and Jackie was in one long labor pain until she finally remembered to unhook her at 40 minutes or so later! What a nightmare she was! No matter, Henry James is here!! Ya-Hoo! Tell Jackie Congratulations for me. Job well done. 🙂 Babies are so wonderful What a blessing. Our families have the same taste in names, apparently. I think if I had another boy he would have been named Henry or James or maybe Henry James!! LOL! Henry is a great name. I love it. They started a Bible series on Sunday on the History Channel and I thought of you. Mark Burnett of “Survivor” fame directed and produced it. As it turns out, it’s so bad that I broke into laughter several times. Linda, it will put you in stitches. Moses, who has lead the Israelites, all 25 of them, some apparently from Pakistan and others from Africa, to the Red Sea, looks like a young and filthy, Ernest Borgnine. Oy! It always boils down to the casting in these epic tales, doesn’t it? I only wished I had been watching your Sunday School stories. I think yours are more accurate! haha!! I’m so happy for you and your family. Enjoy these first days! Thank you so much Lisa! It is such a happy time and all the trouble is soon forgotten. (Otherwise the human race would have died out in the first, second generation!!) HA! That is funny that our families have the same taste in names. Oh I definitely have to check out that new bible series on the History channel. A young dirty Ernest Borgnine Moses!! Hahaha! Some of them are from Pakistan and some for Africa! aahahaha! I hope it’s on demand. I’ll see if I can find it. If not, I’ll definitely set reminder. Is it wrong that I would have cold cocked Salisbury steak? Aye, don’t get me started. She is darn lucky you didn’t go Momzilla on her and terrorize her village. Glad that baby and mom made it through safely. One thing I would do though is file a formal complaint with the state or whichever agency oversees midwifes, and have her license revoked if I could. Haha Papizilla! LOL!! I think I’ll tenderize some Salisbury Steak tonight, it might be good therapy! I’d go Momzilla on her but I don’t know where her village is! LOL!! “Having a Baby Can Take a Lot Out of You” hahahaha, you are hilarious! Ha! Thanks Rick. I’ve been waiting a long time to use that line! So glad you enjoyed it! Oh thank you so much Diane. Where would mankind be without us mothers, right? Now all that’s left to do is ENJOY him! YAY! That Salsbury Steak gives midwives a bad name. What a loser; and yes, that is my medical opinion. Luckily sweet Henry made it into our atmosphere without any help from Ms. Space Cadet. Oh my goodness, this was like watching an episode of Downton Abbey but with a HAPPY ENDING. Congratulations, Grandma! But didn’t Jackie also have a baby like two or three posts ago? Wow, I hope they live near each other! They can grow up and be identical cousins like Patty Duke! Double congrats! So happy it all turned out well, despite Salisbury Steak’s intervention.